Baby Gate Replacement Screws: What Size Spindle Rods Do I Need? 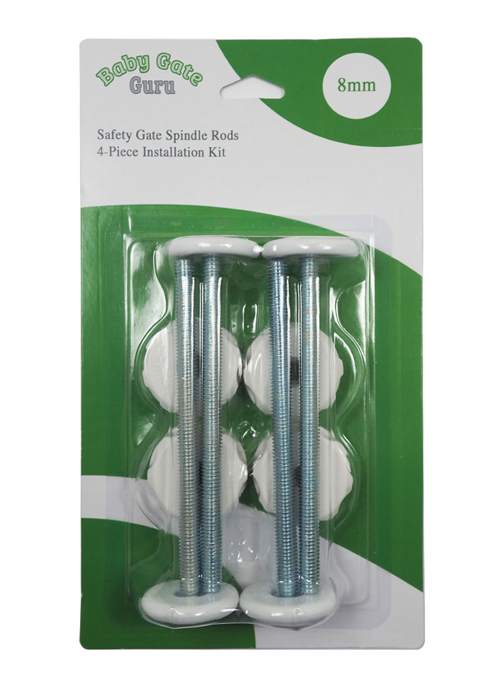 Baby Gate Guru provides a convenient spindle rod replacement set. But what size works best for your brand of baby gate? One common frustration for baby gate owners is losing the 4 spindle rods that go into the sides of pressure mounted gates. These screws or bolts are loose pieces, so they can be easily misplaced when a gate is in storage or left behind after moving house. 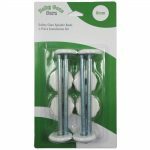 We understand this is a frequent issue for people, so we took it upon ourselves to offer a convenient spindle rod replacement set. Besides being available in multiple colors and sizes to match many different gates, they are also extra long (12cm) to ensure they fit your needs and can even add a couple of extra inches of reach to your gate. But once you’ve found a replacement solution, the next question becomes what size spindle rod do you need? What Size Spindle Rod Do I Need For My Gate? Spindle rods typically come in 2 sizes to fit all the various types of safety gates out there: 8mm and 10mm (also referred to as M8 and M10). Not every gate uses exactly these sizes, but choose the correct size spindle rod and you can fit nearly any gate well enough to work great. If you have a gate from a different brand, let us know in the comments and we can do our best to find out which bolt size works best for it and add it to the list. You can also measure the holes where the baby gate screws go into to determine the correct size yourself. If they are 8-9mm wide, an 8mm spindle rod will work best. If they are closer to 10mm, then go with a 10mm spindle rod replacement set. If you are unsure, we suggest ordering 8mm since those will also fit larger holes, and will not move around when tightened. The opposite isn’t true–10mm spindle rods will be too big to fit some gates at all. Looking for pressure mounted baby gate hardware but don’t see your brand of gate listed here? Let us know in the comments and we will do our best to add it to the list. Do they make 6m pressure mount screws? Hi Rachel. I haven’t ever seen 6mm pressure mount screws for safety gates before. The smallest I know of that brands use are 8mm for Regalo, Summer Infant, Carlson, and North States. At the moment I am not sure what size Frontgate uses, but you could go with 8mm to be safe since 8mm will fit in both sizes. I bought these on Amazon for a Summer Infant gate, I bought the 8MM size based on your guidelines for Summer Infant brand. However, they were too small. Do I need 10MM or is there another size to consider? It is difficult to measure the exact size. Thank you. Hi Sandra. From my experience using the bronze Summer Infant Multi-Use Deco Extra Tall Gate, 10MM spindle rods are slightly too big. They might fit inside with a lot of extra force applied or the help of a hammer, but it’s not a good fit. As a result, the 8MM size fits better. Could I ask what you mean by they were too small? Even if it’s not a perfectly snug fit inside the hole, if the 8MM bolt fits inside the hole and you tighten it against the wall using the plastic adjustment wheel, you should end up with a securely fitted gate. Thank you for your question. Let me know if that answers it sufficiently for you or not. Do you know what size spindle rods are used on an evenflo baby gate? Hi Sara, I’ve heard that 8mm is the correct size for Evenflo pressure gates, and 10mm is too large. Thanks for your question!